Big Reveal! Striped Maxi Dress – Would I Wear it in Paris? I found a light red suede belt at Second Time Around which is a second hand store I like pretty well. It’s big enough and varied enough that I can usually find something I like in my size. I don’t actually live in the jungle. I did a lot to modify this thing. 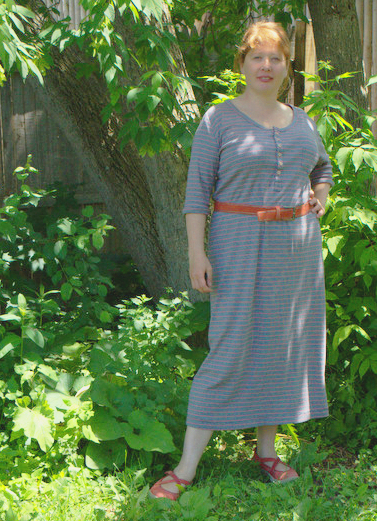 Before I even cut it out, I shortened the torso an inch–partly at the midsection and partly at the sleeve cap. I shortened the skirt a good 5 inches, maybe more. Then lopped off a few more inches and pegged the hem about an inch on each side. The back neck gaped badly and I took that in a solid 2 inches plus. The front neck could have used some narrowing too, but it’s sitting comfortably enough. What else? The hips could have come in a bit, but maybe next time. But let me tell you about the buttons! I found seven tiny flat mother-of-pearl buttons in my button box. 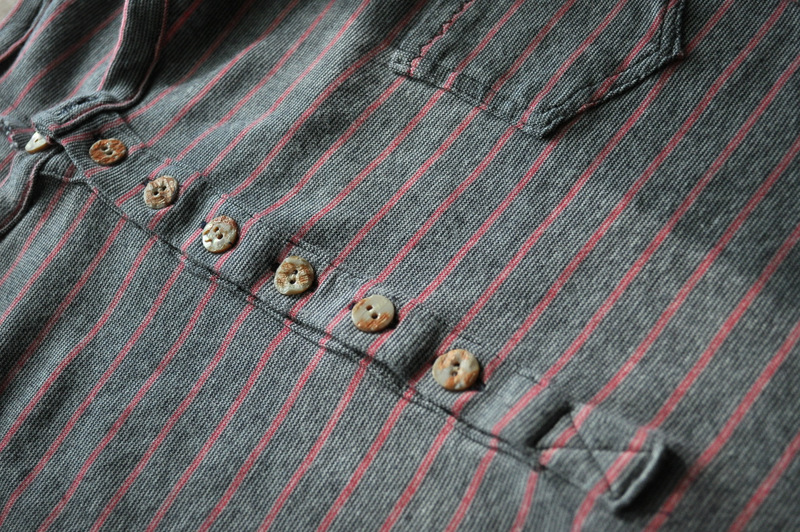 The back of the buttons have a neat pebbly texture and a cream and rusty coloring–far more interesting than the polished side so I just sewed them on upside down. The top button is rogue with the shiny side up. 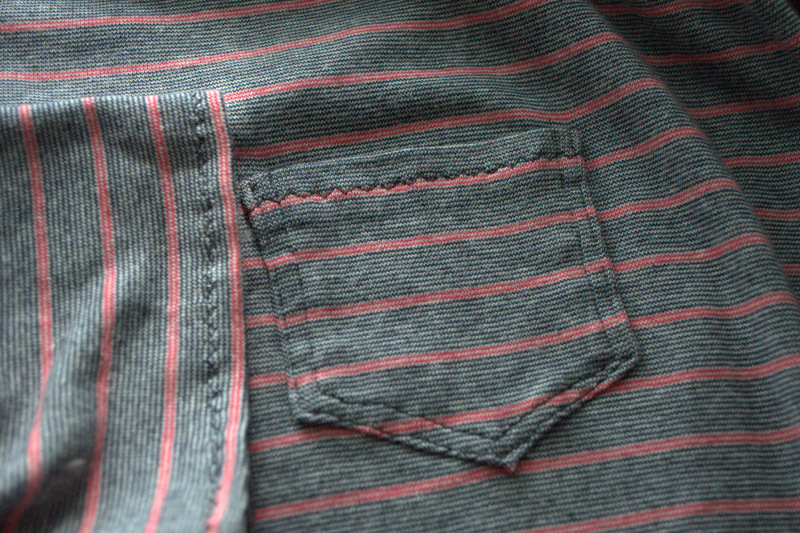 Here’s a detail of the zig zag topstitching I did at the hems. It was neater before the thing went in the wash this morning. 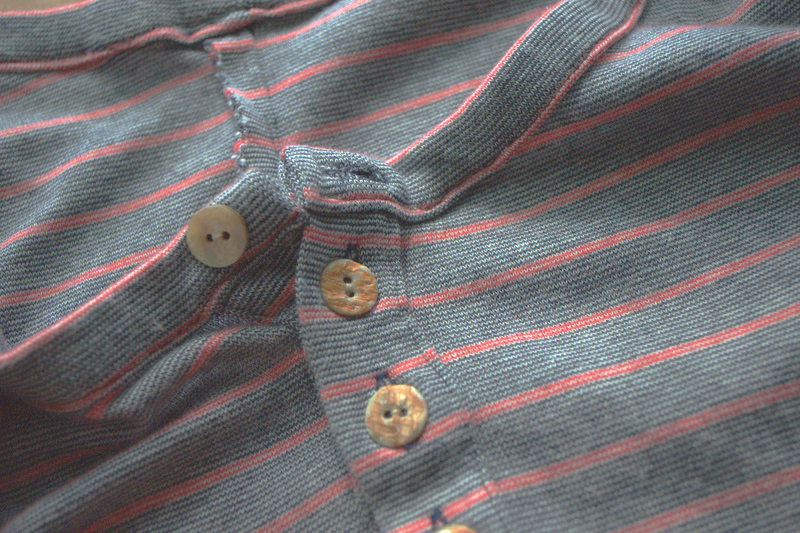 I’m pretty happy with it, wonky pocket stitching not withstanding. It’s really comfortable and I think it’s going to be a great traveling dress for hours in the car. Love it – well done. Buttons are gorgeous. Pingback: A Trip to Greece and What I Wore | Would I Wear it in Paris?